The Respiratory Sensor Belt is an extra Functional Measure to add on to your Alive GP8 System. The Respiratory Sensor can be used as a thoracic or abdominal belt. Teach proper abdominal and rhythmic breathing prior to or in addition to other measures such as HRV. The Sensor does not require any additional updates or upgrades. Plugs into your GP8 Amp. Fully adjustable, standard belt design. Requires the Alive GP8 Hardware and Alive Pioneer Software. Your Alive GP8 Pioneer is ready to accept and use this new Respiratory Sensor belt. Simply add this Sensor and 'plug it in'. Then go to the Graphing Options screen. The Respiratory Sensor comes with 2 Graphing Options which you can choose. 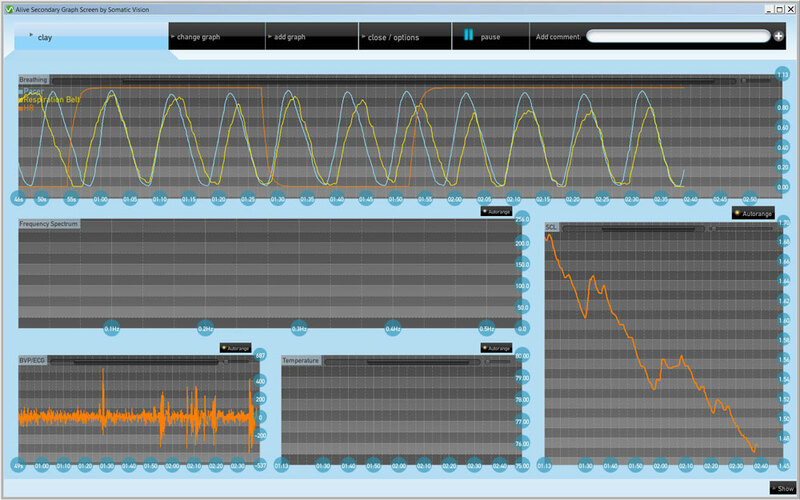 You can make it the primary graph such as is shown here, with 5 functions available to you in one screen. It can also be made as a 2nd or 3rd Auxiliary Graph to display on a 2nd monitor or side-by-side on 1 monitor. Finally, the Respiratory function can be shown by itself in its own simple line graph. The Respiratory Sensor Measure can be shown in this 5 Graph Screen. Top: Breathing. Has Blue Breath Pacer line, Yellow Respiratory Measure Line, Red Heart Rate Line. Left Middle: Frequency Spectrum. Will show the VLF, LF, HF in a 3 colored Bar Graph. Bottom Left: BVP/ECG. Raw BVP Amplitude measure. In this example, the Respiratory Measure is the Primary Graphing Function in the top graph; it is denoted as the Yellow Line. The Blue Line Graph is the Breathing Pacer. Notice that this snapshot starts at the 48-second mark in the Respiratory Graph and the (square box graph, lower right) smaller SCL graph starts at 103 seconds. In the Respiratory Graph, the respiration is only starting to synchronize with breath pacer at around the 1 minute mark. This can be important. For many clients and trainees, they can easily match the Respiratory Signal to the Breathing Pacer. However, if you start them trying to understand their anxiety and Skin Conductance measures, they can be overwhelmed. Have the new trainee learn to use the Respiratory Measure, then show them how well they have done with lowering their SCL and anxiety levels as a result of rhythmic, smoothe, coherent breathing practice. You choose the best feedback method for your use. This enables training for those who have a hard time starting with HRV or who need simple breathing control first. By having your client match their breathing rhythms with the onboard pacer, they can understand how to create a proper rhythmic breathing pattern from normal shallow breathing. Are you familiar with all the ways to gain Optimal Performance for Athletes or Executives? The techniques discussed in this whitepaper by Dr. Yuval Oded can apply to any biofeedback training session from children with attention issues or to adults needing to relax or remove negative thought patterns, it is not limited to Optimal Flow State Performance as highlighted on page 2. 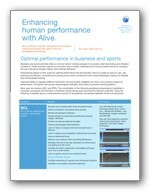 There is a full range chart of specific measures in SCL, BVP & HRV with specific Alive Clinical Games & Environments such that you get a good understanding of how to use your active feedback system.